Some users reported yesterday seeing a pop-up screen that appears when they open the app, saying that the service will close in 15 days time - meaning Inbox could end on April 2nd. The pop-up includes a link for the user to switch to the regular Gmail app, where they are assured their messages will be there waiting for them. 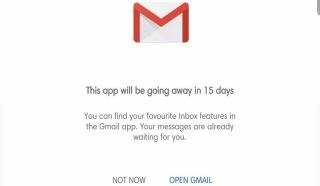 Google also says it is "working hard" to continue porting over some of Inbox's most-loved features.